The Newport Art Museum	is housed in three buildings on a 2-acre Bellevue Avenue campus in Newport's most exclusive neighborhood (map). The Newport Art Museum at 76 Bellevue Avenue (map) specializes in the art of Newport and southeastern New England, both historical and modern, from the late 19th century to the present time. Most of the exhibits are in the Griswold House (1864), a stick-style mansion designed by Richard Morris Hunt, and in the Cushing Gallery, a 1919 neo-classical building. The museum's collection of 2300 works includes art by James Baker, Edward M Bannister, George Bellows, Dale Chihuly, Howard Gardiner Cushing John Frederick Kensett, Fitz Henry Lane, Sue McNally, Richard Merkin, Allison Newsome, Joseph Norman, William Trost Richards, Rita Rogers, Italo Scanga, Aaron Siskind, Helena Sturtevant, Hugh Townley, and Toots Zynsky. The museum also organizes many special exhibitions on a variety of subjects. 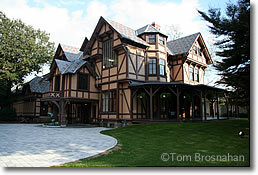 Richard Morris Hunt's stick-style Griswold House, home of the Newport Art Museum.